You can do these steps through the Azure portal, Azure PowerShell, or Azure CLI. In the All services box, enter subscription, and then select Subscriptions. Select the subscription from the subscription list to view. Select Resource providers and view the list of available resource providers. Registering a resource provider configures your subscription to work with the resource provider. The scope for registration is always the subscription. By default, many resource providers are automatically registered. However, you may need to manually register some resource providers. To register a resource provider, you must have permission to do the /register/action operation for the resource provider. This operation is included in the Contributor and Owner roles. To register a resource provider, select Register. 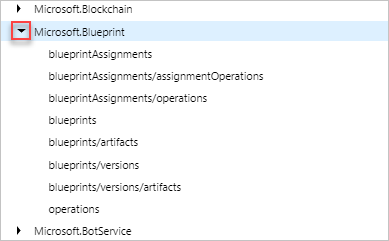 In the previous screenshot, the Register link is highlighted for Microsoft.Blueprint. 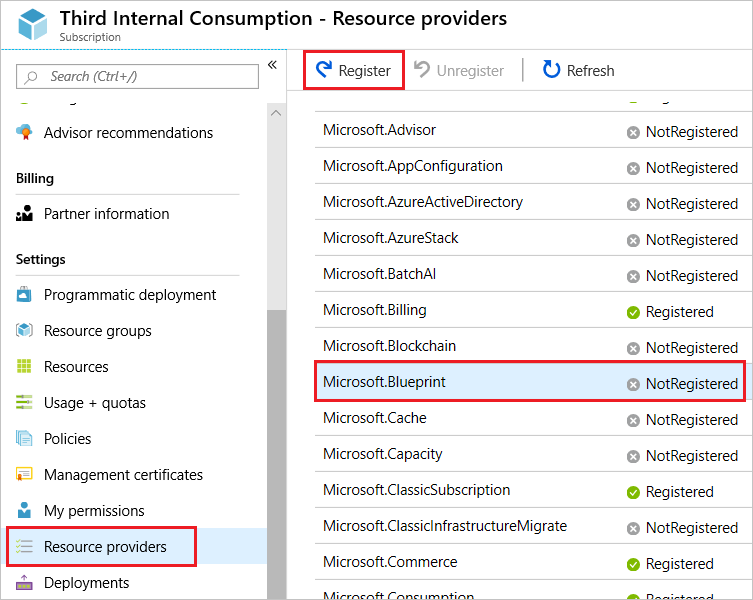 You can't unregister a resource provider when you still have resource types from that resource provider in your subscription. 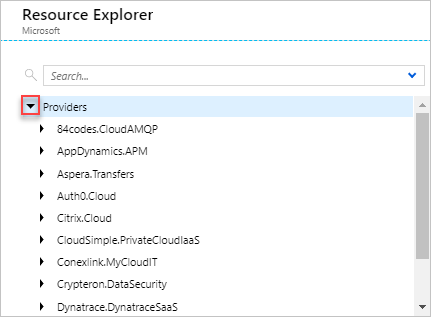 In the All services box, enter resource explorer, and then select Resource Explorer. Expand Providers by selecting the right arrow. Expand a resource provider and resource type that you want to view. Resource Manager is supported in all regions, but the resources you deploy might not be supported in all regions. In addition, there may be limitations on your subscription that prevent you from using some regions that support the resource. The resource explorer displays valid locations for the resource type. The API version corresponds to a version of REST API operations that are released by the resource provider. As a resource provider enables new features, it releases a new version of the REST API. 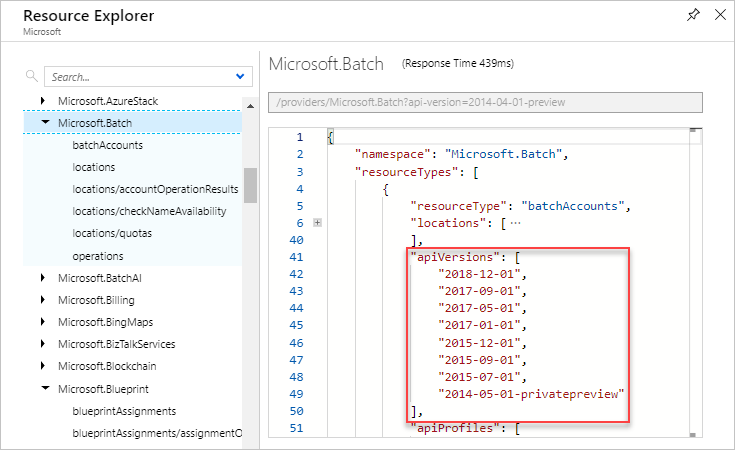 The resource explorer displays valid API versions for the resource type. Registering a resource provider configures your subscription to work with the resource provider. The scope for registration is always the subscription. By default, many resource providers are automatically registered. However, you may need to manually register some resource providers. To register a resource provider, you must have permission to do the /register/action operation for the resource provider. This operation is included in the Contributor and Owner roles. The API version corresponds to a version of REST API operations that are released by the resource provider. 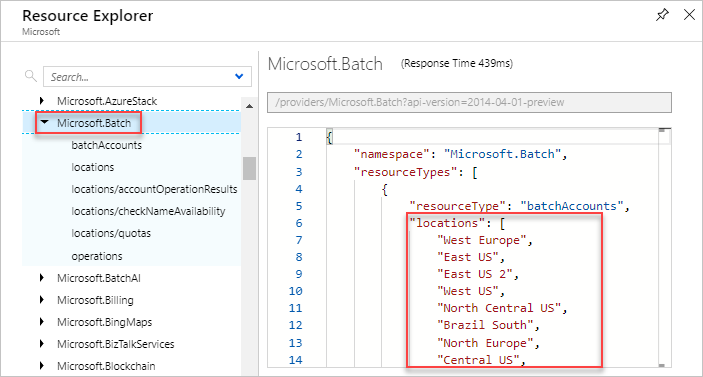 As a resource provider enables new features, it releases a new version of the REST API. Resource Manager is supported in all regions, but the resources you deploy might not be supported in all regions. In addition, there may be limitations on your subscription that prevent you from using some regions that support the resource. To get the supported locations for a resource type, use. Which returns a message that registration is on-going. To view the resource provider template schemas, see Template reference.